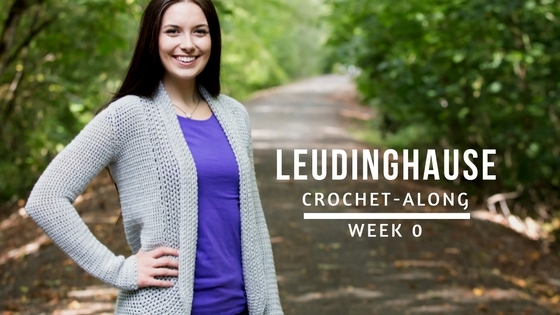 Welcome to the Leudinghause Crochet-Along! I’m unbelievably excited to show you this design! Once again I have tried to design a cardigan with my fans in mind. I tried to keep the design simple but also wanted it to be something that was practical and over all, wearable. First, I want to remind you the PDF is still available to purchase HERE if you’d like. Keep in mind, all the info you need is located below for FREE but if you’d like something to print the PDF may be something you’ll want to purchase. Don’t forget to scroll all the way down to enter the GIVEAWAY! Here is a video explaining everything for this week. If you are looking for specific information I have noted at what times I start talking specific things in the post below. I will add all links to this post as we go. You may find it helpful to bookmark this page to come back to if you can’t find a specific post. If you watch the video above I explain this schedule in more detail at 6:55. This week you will have 1 week to get ready. This means you will first need to choose a size so you can get the appropriate amount of yarn. If you need more help choosing a size please watch the video at the top of this post. I start talking about sizes at 10:18. The cardigan pictured in Donahue (grey) is shown in size S on a 34″ bust. The cardigan pictured in the Beet (red) is shown in Size M also on a 34″ bust. Ideally the cardigan should fit snug with about a 3″ overlap in the front. Here is the schematic as well (click on it to make it larger). This pattern calls for Universal Yarns Uptown DK (100% acrylic; 273 yd/250 m/ 3.5oz/100g; light/DK/3 weight). You will need 6(6, 7, 7, 8, 9, 9) balls. The grey cardigan is made in Donahue and the red sweater is made in beet. You can purchase this yarn in a few different places. You can go right to Universal Yarns website, Amazon, or Annies. If you are in the US, Canada or Mexico you should be able to find it but outside of North America you will have to make a substitute. When choosing another yarn look for something similar to Uptown (you can read my review HERE). Wool Warehouse and Deramores are also good sites to checkout. I’m using a G/4mm Furls Odyssey hook. You will need whatever hook gives you the right gauge (I’ll go over that next week). Washer and dryer (it’s going to be EASY!). Iron and surface to iron on: This is optional if you’d like to steam block. Both of my samples were NOT steam blocked but if you are on the fence you can try it on your gauge swatch. I’ll explain how to do this and why I chose not to next week. Yarn needle: I like to use a sharp (metal) needle for weaving in ends and a plastic yarn needle for seaming. Ruler: I use a rigid ruler for measuring gauge and a measuring tape for other measurements (measuring the sweater or myself). 6 Stitch Markers: I find scrap yarn works best. Knit Klips: I use these when seaming in the sleeves. I only used one at a time. You can also use a safety pin or a regular straight pin. This giveaway is so awesome! One luck winner will win the enough yarn from Universal Yarns to make their sweater as well as a Furls Odyssey Hook from Furls Crochet. The winner will choose the color yarn they’s like! All I need from you is an email in the Rafflecopter form below. This giveaway is open to all US residents, must be 18 or older, void where prohibited. The giveaway ends on August 26th at 12am (pst) so get your entries in quick!